Gardner-Edgergon was a part of the 1-vs.-16-seed game a year ago as well, but as the No. 16-seed. The Blazers’ incredible turnaround has been orchestrated by new coach Ryan Cornelsen. Gardner-Edgerton’s strength includes a talented offensive line and a backfield that includes the likes of quarterback Teven McKelvey, fullback Jacob Hunsperger, and running back Luke Jennings. Hunsperger scored three times and Jennings two in last week’s 35-14 win over Shawnee Mission West. While Blue Valley Northwest is winless, the Huskies won’t back down from their former Eastern Kansas League rivals. Northwest averages 17 points per game and has twice been within single digits of beating Harrisonville (Mo.) and Blue Valley Southwest. Two teams seemingly trending in opposite directions make up this first-round game. SM North has won four of five games under first-year coach Zach Rampy. The Indians have posted a pair of one-point wins over Olathe West and Olathe East, and defeated Shawnee Mission West by three points. Meanwhile, SM Northwest has lost three straight games since a 4-1 start to the season. The Indians may have the game’s top player in senior receiver Billy Conaway. If the Cougar defense can hold Conaway in check, they have a good chance of earning a rematch with Gardner-Edgerton. Shawnee Mission South and Olathe Northwest will meet in the first round for the second consecutive season. The Ravens won last year’s meeting, 34-8, but the Raiders are the favorite this season behind senior quarterback Jack Roberts. Roberts has rushed for 1,021 yards and ten touchdowns, while passing for 852 more yards and 13 scores. The Raiders are seeking their first postseason victory since 1990. SM South has only beaten Olathe Northwest one time in nine overall meetings. Blue Valley sits at 4-4 having survived a touch schedule and overcome numerous injuries in the backfield. That has placed more pressure on senior quarterback Walker Kinney who has delivered to the tune of 1,840 passing yards and 18 touchdowns. Olathe East has had their own injury issues, but the Hawks got back on the winning track with a 40-26 decision over Olathe South last week. Olathe North has one of the most productive backfields in the state with Daymonn Sanchez and Arland Bruce, IV. Sanchez has rushed for 1,553 yards and 23 touchdowns, while Bruce has added 893 rushing yards and 13 scores. Bruce, just a sophomore, now has more than 1,700 rushing yards in his career and has shown his ability to throw the ball this season with 818 passing yards and seven scores. Olathe South has posted a 2-3 record since starting quarterback Evan Foster was injured. The Falcons are playing a lot of young players, including Andrew Nehrbass who has 805 rushing yards on the season. A.J. Shields is one of the top receivers in the class with 828 yards and eight touchdowns on 40 receptions. But Blue Valley West is much improved. The Jaguars have their own dynamic quarterback- receiver combination with Greg Riddle and David Brown. West also has a pair of capable backs in Abe Lawrence and Edgar Hunley, although Lawrence did not play last week against Blue Valley. This should be a good matchup, but don’t be surprised if Blue Valley West pulls off the seed upset. Lawrence gave a spirited effort against cross-town rival Free State last week, but Steve Rampy’s Lions may be in for a difficult road trip tonight. Derby has been nothing short of dominant in rolling to an 8-0 start. The Panther defense has allowed approximately 150 rushing yards total, all season. On offense, Hunter Igo hasn’t allowed the Panthers to skip a beat after an injury shortened the second straight season for starter Grant Adler. Tre Washington has been a breakout star for Derby in the backfield. Maybe the most intriguing game in the opening round, Junction City will try and take down a Dodge City team that has won three straight. Jaiel Johnson has been explosive for the Red Demons, especially in the past three weeks. Meanwhile, Junction City has dropped two in a row to Topeka Seaman and Emporia. Still the Blue Jays can put up points with Rooster Adams at quarterback and Russell Wilkey in the backfield. Topeka High may have the most talented backfield in the state. The depth of the Trojan backfield was on display last week as Ky Thomas rested a nagging injury and Topeka easily rolled past Topeka West. Jacqez Barksdale rushed for 221 yards and two touchdowns on only eight carries and quarterback Da’Vonshai Harden added two rushing scores. When you add in Thomas, defenses have three electric players they have to try and account for on each snap. This is a rematch of a first-round meeting last season won by Garden City, 7-0. Garden City has just two wins and is currently in the midst of its second, three-game losing streak of the season. The Buffs just haven’t found enough offensive production other than Carlos Acosta. Washburn Rural is another dangerous team that helps highlight the depth of the west side of Class 6A. The Junior Blues are led by senior dual-threat quarterback Jordan White and receiver Preston Williams. Running back Jaylen Carter missed last week’s game after suffering a knee injury in practice, but Rural should have enough to get to the next round. Wichita North was a great story to open the season with a pair of victories, but the Redskins have since lost six straight. Joe Williams has had a break out season with 1,346 rushing yards and nine scores, but he’ll need a huge game to outscore Free State. The Firebirds are really talented, but have shown a couple moments of lapses this season. Still it seems like each time Kansas State commit Keenan Garber touches the ball he scores. The Firebirds can also run it right at you with Jax Dineen. If healthy, Free State is a definite title contender. Campus has enjoyed a big turnaround with 1-8, 2-7, 3-6, 5-5 and 5-3 marks in the last five years. The Colts will finish over .500 for the first time since 2005. The two teams have split the last eight meetings with the last game coming in 2015. South has scored 189 points and permitted 278, while the Colts have one of 6A’s better scoring defenses with 173 points allowed and 211 scored. Aside from a 9-7 loss to rival Junction City, Manhattan has been one of the more impressive teams in the classification. The Indians also own a 21-20 overtime victory over Topeka High, although the end of that game is subject to debate. Kevontae McDonald is one of the state’s top backs and sophomore Dane Aschenbrenner has played well. Wichita Southeast has posted wins over Wichita North and Liberal this season, but the Golden Buffaloes have been much more competitive this season under coach Erik Dobbins. West defeated East, 28-7, last week and have won four straight games. The City League teams have posted similar defenses. East has allowed 187 points, and West is at 167. However, West has tallied 270 points, and East has just 124. West has matched last year’s win total from a 5-4 season. West has captured four straight in the series. Top-seed Aquinas had the week off after it’s emotional win over Bishop Miege. The Saints’ have been one of Class 5A’s most impressive teams this fall and are expected to make a deep playoff run. Having lost 42 consecutive games, Highland Park enters the bracket as the 16-seed for a third straight season. The previous two years the Scots were matched up against top-seed KC Schlagle in the opening game and they almost pulled off the upset in 2016. Such a feat will prove much more difficult against the Saints. Seaman has had an up-and-down season having endured a three-game losing streak in between a couple of impressive victories. The losses were to the best of the Centennial League in Manhattan, Emporia, Topeka High, and Washburn Rural. The Vikings also have impressive wins over Hayden (13-0) and Junction City (21-20). Sumner Academy and Seaman have one common opponent in Highland Park. The Sabres beat Highland Park 36-34 back in Week 2, while Seaman beat Highland Park 56-8 the week before. Mill Valley is a definite contender on this side of the 5A bracket. The Jaguars are 5-3 with losses to Aquinas, Bishop Miege, and Blue Valley North. The Jaguars lost at Aquinas, 24-13, in Week 4. Mill Valley also has the benefit of getting senior running back Cameron Young back from injury. In five games, Young has rushed for 422 yards and seven touchdowns and nearly taken over Tyler Green’s team lead. Jordan Preston has passed for 1,503 yards and 8 scores, while Logan Talley is having another all-state caliber year with 53 catches for 603 yards and a touchdown. Lansing has won four straight games under new coach Dylan Brown and the Lions’ five wins this season are the most the program has had since 2015. The Lions’ best win came 14-13 over 4A East No. 2 seed Basehor-Linwood back in Week 2. Konnor McQuillan leads the team with 916 rushing yards and 11 touchdowns. Meanwhile, St. James Academy’s 1-7 record may be unimpressive, but you must consider the competition they’ve played in the EKL. Among the Thunder’s losses are a one-point decision to Mill Valley and a three-point loss to Blue Valley West. St. James quarterback Jack Moellers was injured a couple of weeks ago, but Brady Feldmen has had two weeks to gain experience behind center. Don’t be surprised if the Thunder upset Lansing this week. These two United Kansas Conference (UKC) members will meet for the second time this season. De Soto rolled to a 56-0 shutout of the Golden Bears in Week 3. De Soto is a young team, but has talent and some speed. Quarterback Jackson Miller is going to be a really solid player for the Wildcats for the next two seasons. They should handle Turner again and move on to the next round. Blue Valley Southwest comes in as the 10-seed for a second consecutive season. The T-Wolves will travel to Shawnee Heights to try and top the T-Birds. Billy Bartlett has had another solid year at receiver with 586 yards and 5 touchdowns on 54 receptions. The T-Wolves have used a pair of quarterbacks this season as two-year starter Will Eldridge decided not to play his senior season. Sophomore Tanner Curry passed for nearly 600 yards and seven touchdowns, but hasn’t played since Week 4. Logan Moore has taken over and passed for 586 yards and a score. Shawnee Heights enters bracket play having lost two in a row. The T-Birds were beaten 14-0 by De Soto two weeks ago before a 27-19 loss to Lansing last week. Blue Valley Southwest beat Lansing 37-14 back in Week 1. The Pioneers and Stallions feature a pair of really good running backs. Leavenworth’s Jahawn Byrd has rushed for nearly 800 yards and eight touchdowns. Schlagle’s Jaylin Richardson, a KC Turner transfer, has had his share of break out games as well. If the Stallions can get Richardson going, they have the ability to advance to the second round for a third straight season. A couple of weeks ago we were talking about Olathe West’s first victory as a varsity program. Soon we could be discussing their first ever postseason win. The Owls will be favored against Washington given their strength of schedule all season. In a span of three weeks, Olathe West beat KC Turner 68-0, while Washington beat Turner 48-26. Quarterback Zac Krause has passed for 1,345 yards and 13 touchdowns and added five rushing scores. Junior receivers Connor Delong and Caden Barnard lead the team with 496 and 401 yards, respectively. One of the prevailing storylines for 2018 is whether Northwest can win the first state football title in school history. The Grizzlies have significant Division I talent and lead 5A by a significant margin with 433 points. Reagan Jones has passed for 1,592 yards, Breece Hall, an Iowa State commit, has rushed for 1,118 yards, and Zion Jones has 405 receiving yards. Jordan Younkaman and Marcus Hicks, an Oklahoma commit, has six sacks. Josh Carter has 87 tackles. While Salina South has struggled, sophomore Terran Galloway has passed for 981 yards. The Cougars ended a seven-game losing streak with a 35-13 home win versus Newton. Emporia has played multiple close games. The Spartans opened the year with a 28-24 home loss to Washburn Rural, and fell 16-13 at Legend (Colo.) and 27-26 versus Topeka. Last week, Emporia won at Junction City, 23-20. The Spartans have a balanced effort with three rushers between 393 and 592 yards. Senior quarterback Jace Stewart has tallied 1,247 total yards with 12 total scores. Heights quarterback K’Vonte Baker, in just six games, has rushed for 1,241 yards, one of the state’s leading marks. Emporia has scored 247 points, 13 fewer than Heights. However, the Spartans have permitted 145 points, while Heights is at 265. Emporia is tied for fifth in 5A in scoring defense. Carroll has battled through multiple obstacles, including significant quarterback injuries. The Golden Eagles lost on a last-second field goal to undefeated Wichita Northwest in the season opener and also fell to Derby. However, Carroll had a great comeback late versus Great Bend and defeated rival Kapaun – both squads who are 6-2. Carroll, the defending 5A state champion, has played the No. 2 hardest schedule in 5A. Newton, led by former Bishop Carroll player and assistant Chris Jaax, took a surprising loss to previously winless Salina South, 35-13, last week. Newton has matched last year’s win total and defeated Hutchinson, 42-35, the first win over the Salthawks since the ‘90s. Colton Davis has been a strong dual-threat quarterback for the Railers. Salina Central entered this season with an 18-game losing streak and has enjoyed a big turnaround with first-year coach Mark Sandbo. Taylon Peters has rushed for 1,560 yards, fourth-best in the state. The Mustangs opened the season with a 44-7 win against Eisenhower, the victory that set the table for a successful season. Since ’14, Salina Central is 3-0 against Eisenhower. Eisenhower (3-5) is 12-seed for a second straight season. Liberal has taken a five-win drop off after a surprise 6-3 mark last fall. The Redskins have scored in single figures all but two games and have multiple close losses with defeats by seven, one, six and 14 points. Maize has one of the state’s top defenses and senior Noah Stanton, Kansas’ 11-man pacesetter with 11 sacks. The Eagles opened the season with four straight shutouts and played Derby in a close contest last week. Maize has allowed just 70 total points, second-best in 5A. Senior quarterback Caleb Grill, a Division I basketball signee, has delivered a great season as a quarterback and punter. Maize South has enjoyed five straight wins after a 0-3 start that included a 20-3 loss to Andover. The Mavericks has a total score of 192-166, while Andover has scored 157 points and allowed 161. Sophomore quarterback Eli Fahnestock has emerged as a standout player for Andover with 1079 passing yards, although he has missed the last two weeks. For Maize South, Colin Shields has passed for 1,246 yards, and Mason Edwards has rushed for 1,078 yards. Great Bend won the WAC title with a 4-0 mark, its first share of a conference title since ’11, its first outright crown since ’08 and first perfect conference mark since ’07. Koy Brack has passed for 1,647 yards and Alex Schremmer, a transfer last year from Hoisington, has 856 receiving yards to lead the conference and rank in the top-10 in Kansas. Great Bend led the WAC in scoring offense (266 points) and scoring defense (145). 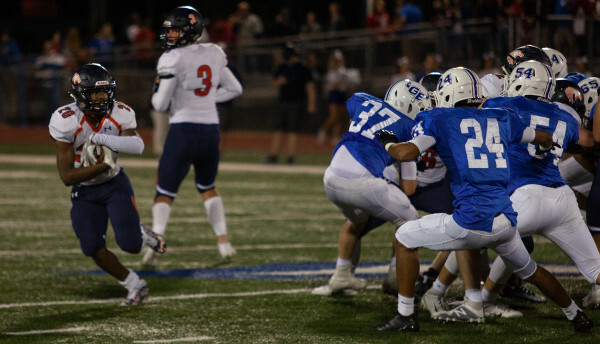 On paper, Kapaun is the favorite with its defense that ranks fourth in the classification with 14.8 points allowed a game. The Crusaders have scored 24.3 points a game. However, Hays High has been known to pull upsets the last couple of years. Hays has three losses by a combined 16 points for new coach Tony Crough. Palmer Hutchinson has thrown for 1,376 yards and accounted for 20 scores. Hayden Brown has 709 rushing yards and 13 offensive scores. For Kapaun, Scott Valentas, who has committed to Ivy League’s Columbia University, has 103 rushes for 537 yards and nine scores. The Crusaders have rushed for 137 yards a game and 3.5 yards a carry. Kapaun’s Jacob Schmitz has 478 receiving yards. This is the first matchup between the teams since a 27-20 Hays playoff win in 1993. Current Maize coach Gary Guzman coached Kapaun in that contest.